7 years ago, a friend gifted us a big metal bucket of raspberry shoots. We put them in the ground and for the longest time they didn’t do anything. I’m not sure what happened this year, but those humble sticks have morphed into full-blown bushes and we’ve hit the raspberry jackpot! I’ve lost count of how many bowls I’ve brought in, and besides eating them plain or in fruit crisp, I’ve been transforming them into these yummy bars. 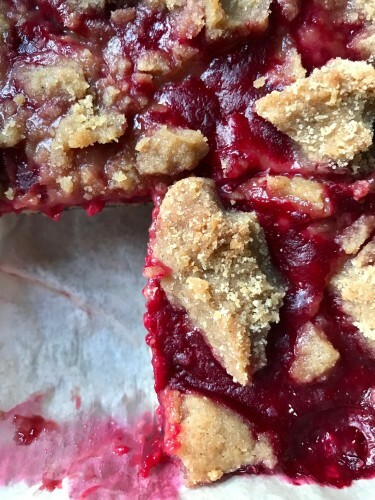 A cross between cookie bar and pie, these treats have a thick and juicy raspberry layer sandwiched between a lemony crust and a cinnamon crumb. 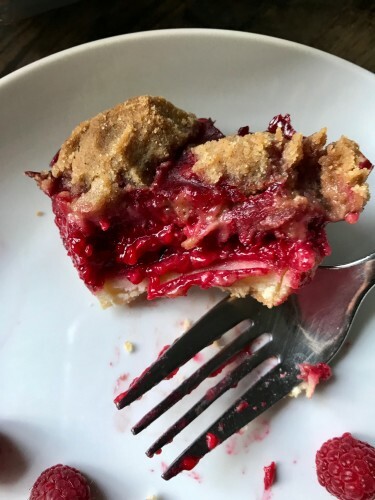 It’s like pie – but better! Because instead of having to roll out a crust, this one is just mixed together and pressed into the pan. Pre-bake and you’re on your way to a super stellar low-sodium dessert! The only catch? Like most pies, you MUST LET THESE COOL before cutting. You’ll want to dive right in! But wait. They’re worth it. Let them sit on the counter until they reach room temp. Or let them sit until room temp, refrigerate, and then cut. You will be rewarded with bars that not only taste like a million bucks, but look it too. These can be made using your choice of fat. I’ve suggested either unsalted butter or vegetable shortening, but you could also try using margarine or coconut oil. I haven’t tried making them with a liquid oil like canola or olive, so can’t tell you how that would go. But if you do, please comment back and let us all know! 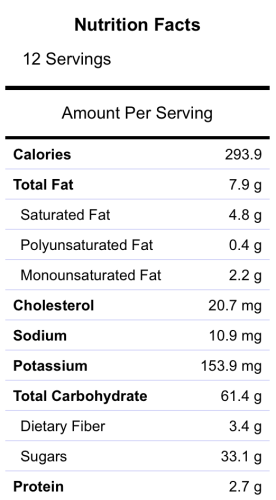 The nutrition information was calculated using unsalted butter as a baking standard. The jam layer can be varied as well. I used grape jelly because it was the only jam left in the house. And they still tasted great! 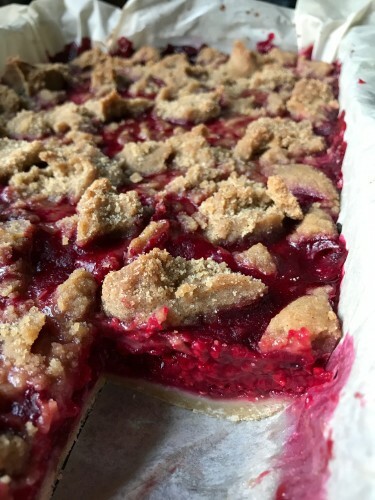 I used fresh raspberries for these bars because of my surplus. But if you don’t have fresh, try frozen; just thaw them first. If you don’t have raspberries, these would also be delicious with most any type of berry or cherry or some combination thereof. If you try something else, let me know! It’s an excuse to make them again. SODIUM CONTENT: 11 mg per bar. Preheat oven to 375 degrees. Line an 11 x 8-inch baking pan with parchment and set aside. To make the crust, measure the flour, sugar, and lemon zest into a mixing bowl and whisk well to combine. Cut the butter into the mixture until it’s super fine and evenly-distributed, then add the lemon juice and squeeze together to incorporate well. Press the crumbs firmly and evenly into the prepared pan to form a crust. Place pan on middle rack in oven and bake 15 minutes. While the crust is baking, measure the fruit jam into a small microwave-safe bowl, cover, and heat for 1 minute. If you don’t have a microwave, simply place into a small saucepan and heat on low until liquidy. Stir well. Once the crust is baked, remove from oven and spread the heated fruit jam evenly over the top. Briefly set aside. To make the filling, place the raspberries into a mixing bowl. There may be quite a lot of juice and that’s okay; I didn’t drain any and they worked fine for me. If you want a firmer bar, feel free to drain some of the liquid. Add the corn starch and stir gently to combine. Spoon the berries evenly over the crust. Set aside. To make the crumb topping, measure the flour, brown sugar, cinnamon, and vanilla into a mixing bowl and whisk well to combine. Cut the butter into the mixture until it resembles coarse sand and sticks together in lumps when you squeeze it. Crumble the topping over the raspberries evenly. Place pan on middle rack in oven and bake 30 minutes. Remove from oven and set aside on a wire rack to cool fully. Bars may be placed in the fridge to speed cooling (NOTE: the crumb topping may become harder to cut)! Once FULLY COOLED, cut into bars and enjoy! I love this kind of recipe. I think these kinds of bars are even better than pie. Thanks for posting this. You’re so welcome, Shambo!! Hope you enjoy! Yayyyyy! Hope you enjoy too, Jenn! These look wonderful, am making soon! Thanks for all the great recipes! 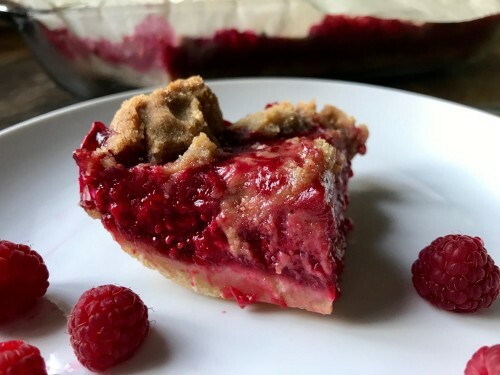 How would I replace the fresh raspberries with frozen? Hi Cassandra! So sorry for the delay – I just got this! If you’re using frozen raspberries, I’d just thaw them before proceeding w the recipe. If there seems to be a ton of juice, feel free to drain some, though the fresh berries I used were SUPER juicy and it turned out fine. Really hope you enjoy the bars!